When the machine’s seat is inclined, it’s gluteus medius that works. 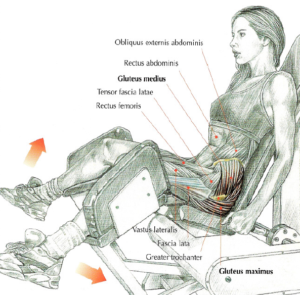 When the machine’s seat is slightly inclined or vertical, it’s the upper part of the gluteus maximus that works. The ideal is to vary the torso’s inclinaison in the same set. 10 reps with your back glued on the machine’s seat and 10 reps with your torso leaning forward. This exercise is excellent for women because it tone the upper part of the hip. It gives the buttocks a rounded appearance, making the waist look slimmer.